WARDAK, Afghanistan — Sgt. 1st Class Gregory Frikken says three combat tours in Iraq and Afghanistan have robbed him of precious time with his family, but have also changed him — in some ways for the better. A sense of personal strength, appreciation for life and love of family have all been enhanced, says Frikken, 39, who directs artillery fire for 10th Mountain Division troops fighting here. "I will never be the same person I was before my combat experiences," he says. 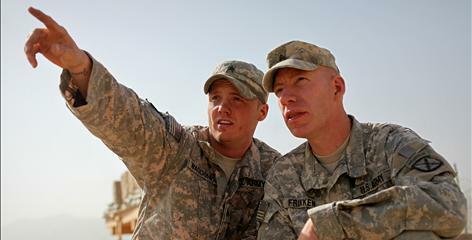 What happens to soldiers like Frikken has led Army leaders to develop a resiliency program that urges GIs to look inward and discover how combat may have made them emotionally stronger. Research appears to show that many people can emerge from traumatic experiences with greater self-confidence, a keener sense of compassion and appreciation for life, says Brig. Gen. Rhonda Cornum, director of the Army's Comprehensive Soldier Fitness program. Cornum and other experts call this concept post-traumatic growth. Although the military focuses attention on troops who develop mental health conditions in combat, Cornum says, the majority of war veterans do not suffer post-traumatic stress disorder (PTSD) or other problems. Yep - I get it too. I see the same effects on/in my son (two-deployment Iraq veteran). He's a much stronger individual. w/v = ouraw - close, I guess! "A sense of personal strength, appreciation for life and love of family have all been enhanced." This is what I have seen in the veterans Ihave know. They are, for the greater part, NOT the broken, tortured individuals portrayed by hollywood! When I came back from SEA I was plunked down in the middle of hippies. After awhile they were asking me for answers. Same age, same education, but a thousand more years of living. "...greater self-confidence, a keener sense of compassion and appreciation for life..."
That's precisely the effect Desert Storm had on a friend of mine.